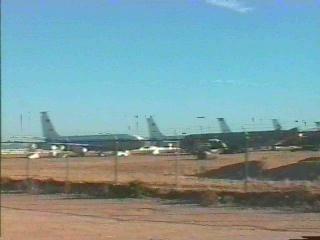 Don Boelling, a former Senior Wing Instructor at Davis-Monthan AFB in Tucson, AZ has set up his own TITAN-II page. Don's page has tons of textual info, links, and animations. 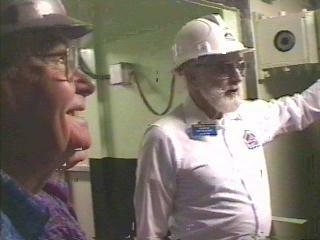 If you become interested in "Atomic Tourism" you can visit the Atomic Tourism Homepage. 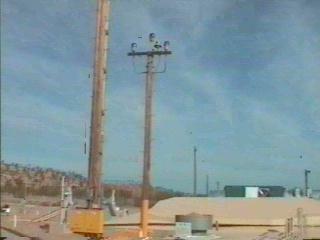 The three lights on the pole indicate the safety status. Green for safe (all clear), Yellow for caution (approach with caution), and Red for unsafe, (do not approach). The Silo door is below the pole. 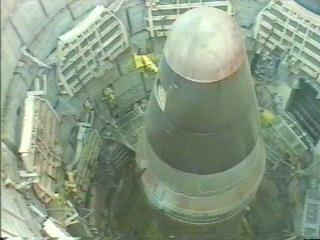 Peeking through the half-open silo door reveals the nose of the missile. Every few hours, a Russian satellite checks that these concrete blocks are in-place. They prevent the silo door (left) from opening more than half-way. 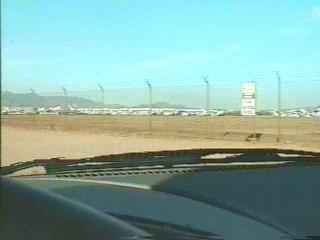 This was done to comply with SMART (Strategic Missile Arms Reduction Treaty), else the site would have had to have been destroyed. 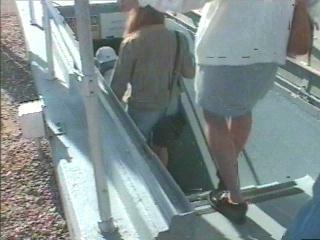 Decending into the control center (200ft below). 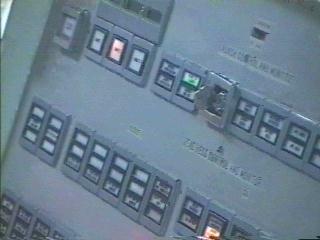 To enter the control center, you must pass through two of these doors. Note the locking pins. The doors are 4ft thick concrete with 2" rebar every 8". They can withstand a blast from an 8x Hiroshima bomb. Nobody can wander around alone. At least two men must be present at all times. The computer. 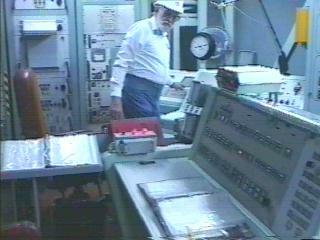 The rack with the three round gauges is the "facility monitoring console." 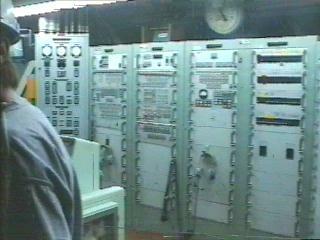 To the left of it is the "Deputy Commander's console" which is where KEY#2 is inserted (two keys needed to launch) . The top of the third (from left) rack is where you enter the code for the butterfly valve. Seven incorrect entries destroys the butterfly valve and the Titan-II turns into a paperweight. The buttefly valve is what allows the fuel and oxidizer to mix, causing a launch. Clock indicates local time, Zulu time (GMT) is on a seperate clock to the left. All electronics run from 28VDC. There are 2 battery backups and a 500HP Diesel generator. 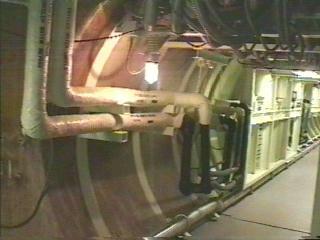 Everything after the second blast door is isolated from shock. 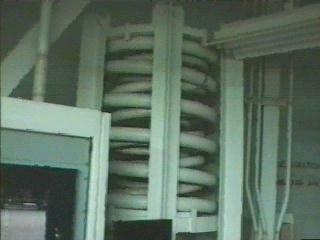 This is one of the springs that suspends the control center. 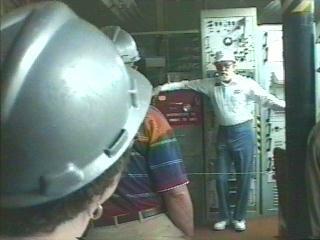 Tour guide showing us the safe where the butterfly valve activation code is located. Also inside this safe is the information needed to authenticate any messages from Washington. Two combinations are required to open the safe, each man knows only one. Thanks to modern electronics, these two racks of equipment have been compressed into this one module. Saves power and generates less heat. 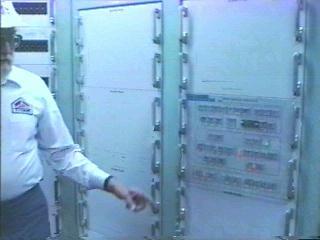 The control panel. KEY#1 is located on the top row. Zulu clock can be seen and the guide is showing where KEY#2 is located. The two books contain the launch procedure. The module above KEY#1 is a fuel and oxidizer tank pressure monitor. 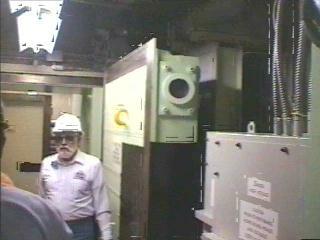 It was installed shortly after a major accident in 1977 at a site in Wichita, KS..
KEY#1. Both keys have to be turned within two seconds and held for 5 seconds. Green light indicates "all OK". The cluster of three square buttons to the left (middle one lit) is the "target select". 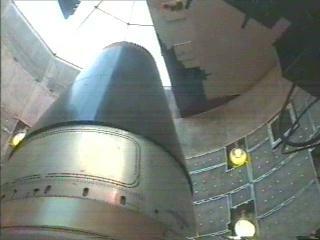 Each Titan-II missile stores three targets. 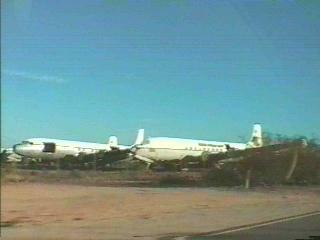 Before launch, you simply select target 1, 2, or 3. 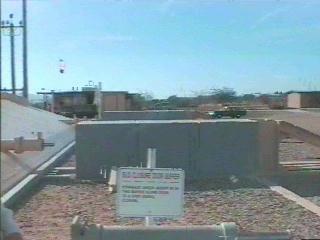 The new guidance system (shown two pictures up) has a 100 target capability, but only three were generally used. 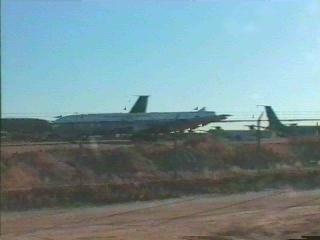 The default target depends on the site and the sortie mission. 8 Foot thick wall protects the inhabitants. There is enough food for 30 days. Silo door is half open to prevent a launch and to keep the Russians happy. 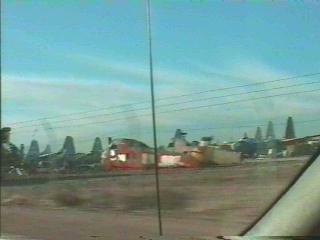 Driving through the desert outside of Tucson, I found a fenced off area with thousands of planes sitting in mothballs. 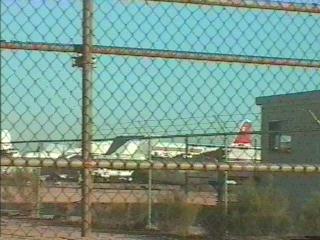 Some of them had parts missing, like the tail of this jet. 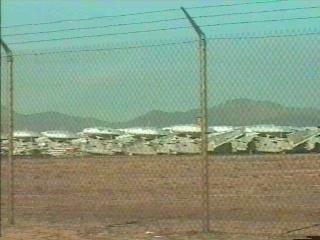 .. and military aircraft seem to be stored here.